Glad you are getting the bugs worked out... you are getting smarter by the day! SLC to V is probably around 800 miles. Unless you have a time constraint, I wouldn't worry about your truck. With that said... having it transported is not a bad idea. I have some words of caution for you - I have very close long time friends who have lived and traveled extensively, mostly in USA, Mexico, South America, and Central America. They have shipped their stuff all over, in containers, freight trucking, and by ship etc. Advice: Be sure you completely understand any and all liabilities and risks and WHO will be responsible for a potential accident or other event that causes you a loss. Make sure the shipping company has an excellent and credible reputation. I'll have to do some thorough research on the companies and see. Thanks for this piece of advice! Maybe some of you might be able to help me with a temp gremlin I'm having. Or not having. I have a Japanese 190° thermostat in my truck, which I believe is the stock temp rating for the factory T-stat. It usually sits and goes up and down between 195° to 203° or so. Good job. I think it looks great. 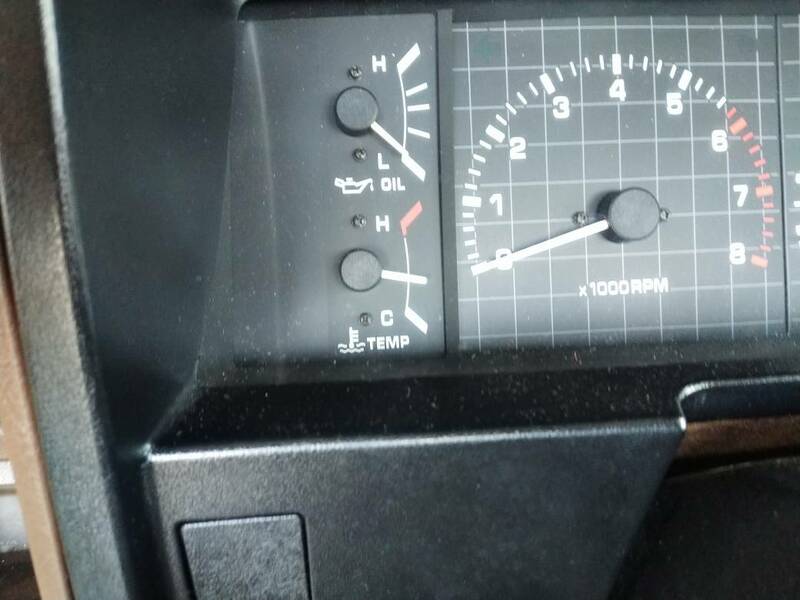 Your going to be amazed at how much more active the mechanical temp gauge is when compared to the stock Moron gauge (similar to an idiot light but in the gauge form). I will tell you not to be alarmed this summer when you see higher temps on your gauge than expected. I see mine go up to 210+ on occasion when pulling a long steep hill. This is completely normal just not show by the stock moron gauge. Your going to be amazed at how much more active the mechanical temp gauge is when compared to the stock Moron gauge (similar to an idiot light but in the gauge form). I will tell you not to be alarmed this summer when you see higher temps on your gauge than expected. I see mine go up to 210 on occasion when pulling a long steep hill. I remembered that exact thing, but I felt it didn't apply. I'm not taking it up any huge hills, so I felt that it should be lower. Could be wrong though, I sometimes am! It fully opens at 212°. I've never seen it go past this. Which I'd say is good, it means that the thermostat fully opens and circulates coolant. Before I swapped intakes, the upper rad hose would be nearly rock hard, now it's soft. I'd be hard pressed to find air in the system, I jacked the front up high and ran it for 20 mins with the funnel connected. And a few minutes after shutting it off at idling temp, I could remove the rad cap. It wasn't hot at all. Interesting. I love figuring this stuff out. This is a factory thermostat that was created to solve a certain cooling system problem on 22r/22re called "temperature overshoot". It's still a 190 degree thermostat like the original, but it has a second, smaller wax slug to help out under certain circumstances. ready? OK, time to get get bored.... Sometimes when using the heater, the interior fan will drop the temp of the coolant below normal operating temp. The "cooled" water that just came out of the heater core then travels past the thermostat causing the thermostat to close, because it "thinks" the coolant needs to get back up to normal operating temp. 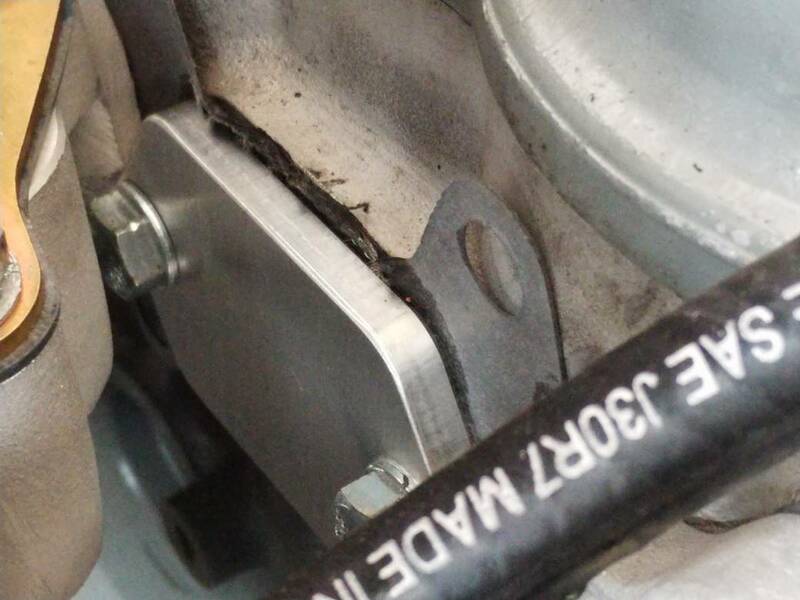 This causes your temp gauge to show overheating or wild fluctuations. So, as you can see, it's a pretty specific problem that it's trying to solve. As a daily driver, without this issue, I still recommend the regular OE thermostat I sell. If you are having this above issue, this could be the fix for it. I've been hesitant to add this to the site only for the reason I didn't want people buying it for the wrong reasons (thinking it'll fix their faulty cooling system). You guys are smart enough to know when you need it, so I'll leave it up to you. The overshoot is what I've thought it might be. I'll have to invest in the later model thermostat. Just got off the phone with Wes over at LC engineering. He told me it's completely normal for the engine temp to fluctuate from 180-210. Makes sense, this is about the operating range. My gauge never goes above 210°. I'll just drive the truck and see. I expect it won't climb above 210° if it hasn't. I'll just start driving and enjoying it! When taking the truck out, the temp was fine and then immediately went up to above 220 while driving. The needle was also very shaky. I'm guessing the damn gauge is broken, there's no reason that I can think of that would lead this engine to run this damn hot, especially when it's 55° out and it's moving. My 1985 22R ran at 190 to 200 all the time. In the summer it could go to 210. I had an AutoMeter mechanical temp gauge. The temperature rating on t-stat is the temperature that it *begins* to open. T-stats are typically fully open between 15 and 20 degrees above the rated temperature. Toyota specs a 190d F t-stat. It begins to open at 190d F and is full open at 212d F.
Installing a lower rated temperature t-stat than spec'd by the auto maker may cause issues with the ECU. It better to install the spec'd t-stat temp rating. Installing a lower temperature rated t-stat only lowers the beginning opening of the t-stat, it still will be full open at 15 to 20 degrees above it's rated temperature. Stant's SuperStat t-stats may provided extra flow based upon their patented Weir valve design. My 1985 22R ran a 190 to 200 all the time. In the summer it could go to 210. I had an AutoMeter mechanical temp gauge. Hey Gnarls, I'm running a 190° thermostat already. Since I have no ECU, I could go to a 180° thermostat according to others. Well, I'm almost certain it's just air trapped in the system. I pulled the cap off and let it set for an hour. The antifreeze level dropped. I'm gonna let it set overnight and see how much it drops. Tomorrow I'll also install the stock temp sender and get that hooked up, not that it'll do anything for the situation at hand. I know I can get this fixed, just a matter of finding out how! I doubt you have any air trapped in the system. The coolant level will drop as it cools.. normal. Maybe you're right, I guess I'll find out tomorrow! If all else fails, I'll do a complete system flush. And a new radiator. If that doesn't work, I'll sell it and buy a Yugo. Today I burped the cooling system even more, and got even more bubble to come up. I topped it off when they seemed to stop coming. So I went and drove it around. At first, it was totally fine. The temp would go up to around 195°, and come back down to 180° ish. Constant fluctuation, even while driving. The stock gauge always stayed at the below half mark. Drove around a little more, and it climbed to 230°! The stock gauge still registered the same (little below half) the temp subsided as I pulled over. On my way home (2 or so miles away) it never went to that temp. 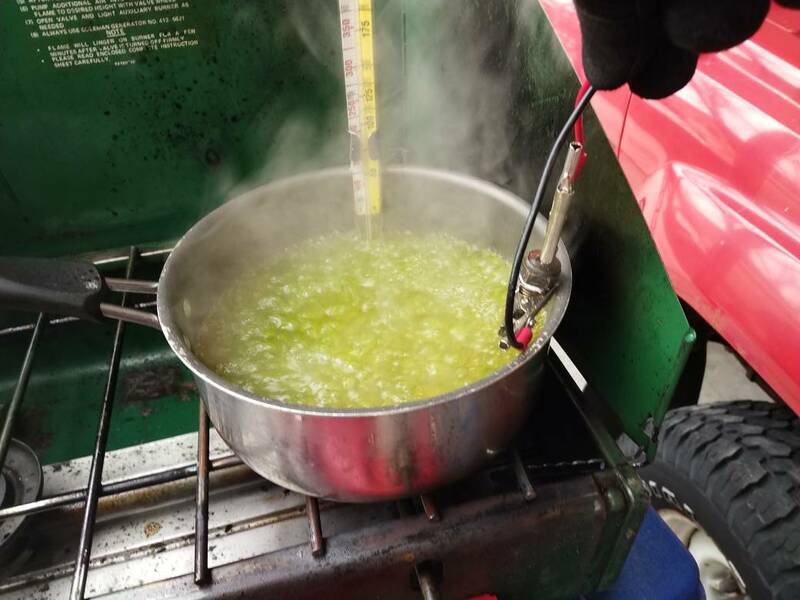 I just got done testing the mechanical gauge, set my camp stove up close to the truck and heated water up. The mechanical temp gauge works fine, I compared it with a kitchen thermometer (the kind for liquids) The temp was nearly spot on. So the mechanical works. The stock must not then? The stock gauge will slowly creep up to the normal below half mark at around 150°. What the hell could be going on here? The fan didn't come on at all. It's 65° out. But that shouldn't matter, it should come on if it hit 230° Fan clutch is off a properly running truck. It's 20° warmer out compared to the last few weeks. The warmest this year that this engine has experienced. Leads me to question wether this is a problem that's existed since day one that's been exaggerated recently with the rise in outside temp. Should I just start replacing everything that I didn't during the rebuild? I'll start with the Rad, Rad cap, New fan clutch (even though I'm not sure this is the issue). What else? Am I missing anything? Thorough system flush? I could have the rad shop check it out, but that would be $100 for them to Rod it (de-solder/clean). At that rate, might as well buy a nicer one. Thing is, I don't remember this being an issue with the old intake manifold. I had the mechanical gauges installed then, too. I didn't record the temp, it was normal. Tomorrow I'm going to test the dummy gauge given the FSM parameters, I'll also drain the coolant from the rad and remove and test the thermostat. Willing to bet it's the Radiator, why? The temp fluctuates at speed and at idle. A potential blockage may produce these symptoms? Really stumped, I'm getting to the point that I can't just keep dumping money into this thing. Well it's not going to hurt anything to upgrade your radiator. I have had slight hot issues that fooled me before with a limp or lame fan clutch. That's what my thought process was, the rad is old... Might as well get a new one. Here's what I ended up purchasing. 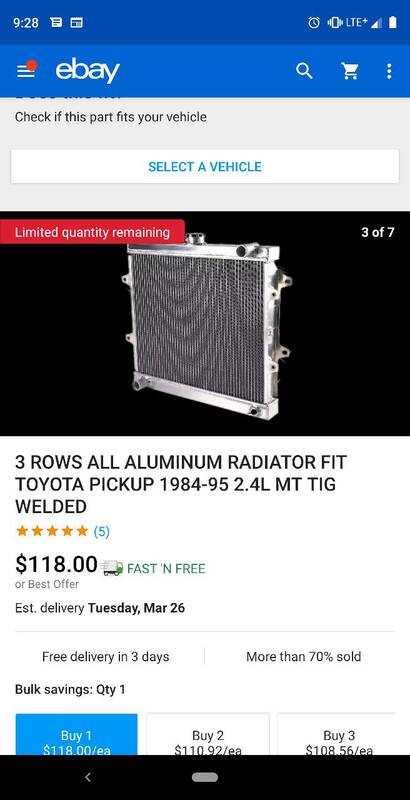 Aluminum three row radiator. Supposed to be a direct fit. I've heard of people having good luck with these. Comes with a rad cap too (won't be using if it's over 13psi) reviews seem great. I may couple it with a 180° thermostat. I'll see what this does, first. Thinking about it, it almost makes sense that it could be a plugged radiator. When I start the truck from cold, up to operating temp, the temperature fluctuates a lot less than if I then go drive it and let it idle. Like the coolant gets warm to the point the rad can no longer efficiently cool it. Lower rad hose was never cold, but was warm. Guess we will see what this does. Looks like the intake will have to come off again. The center block plate on the cylinder head is leaking. Never drips, just seeps. Don't really get why, I used a new gasket and block plate, and I cleaned all the surfaces. I ordered a Toyota intake gasket from 22RE performance. This one has silicone beads around the coolant passages, which from what I understand is how it's supposed to be. The one I used from LC engineering, didn't. I tested the temp sender outside the truck, I heated coolant to around 225°, and it had no effect on the temp gauge. Stayed at the same place. So the stock one isn't true, knew that already. So what Your saying is? The factory gauge is worthless until your on the side of the road overheating? Boy I know I sure wouldn't trust it to give any accurate information. Sounds like a moron gauge to Me. That's exactly what I'm saying. I was only testing it to see if it fluctuated with the temp increase. Nope. Glad I have my mechanical. I think the experiment was awesome. Now all the moron gauge people know it’s worthless until overheating and should consider a mechanic gauge and a gauge pillar. Unfortunately some will still swear by their stock gauges. Much like I did, before I took the advice. The two things I've learned here that I will pass on. Get a Mechanical temp gauge, and a Weber. 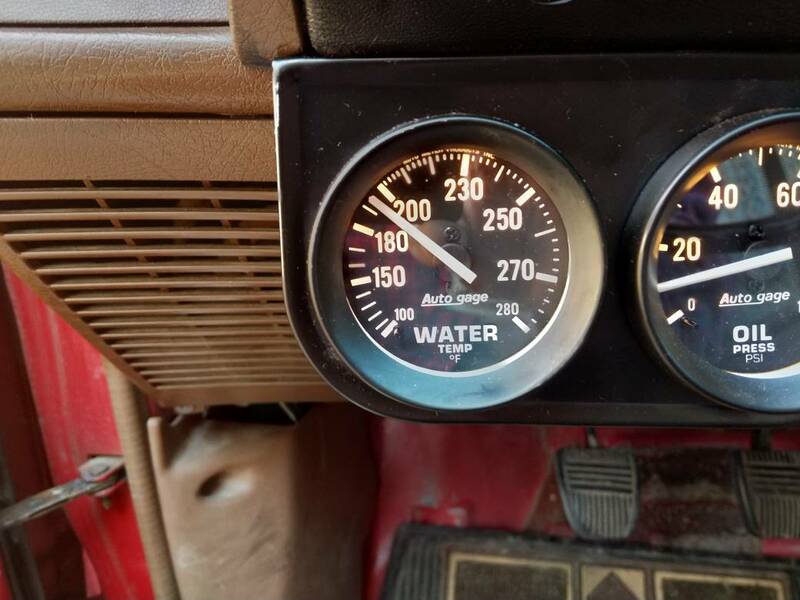 I’ve installed a mechanical water temp gauge and an ammeter (registers amps) in every truck I’ve owned except my current ’86 (yes bgen, I was a moron!)…. 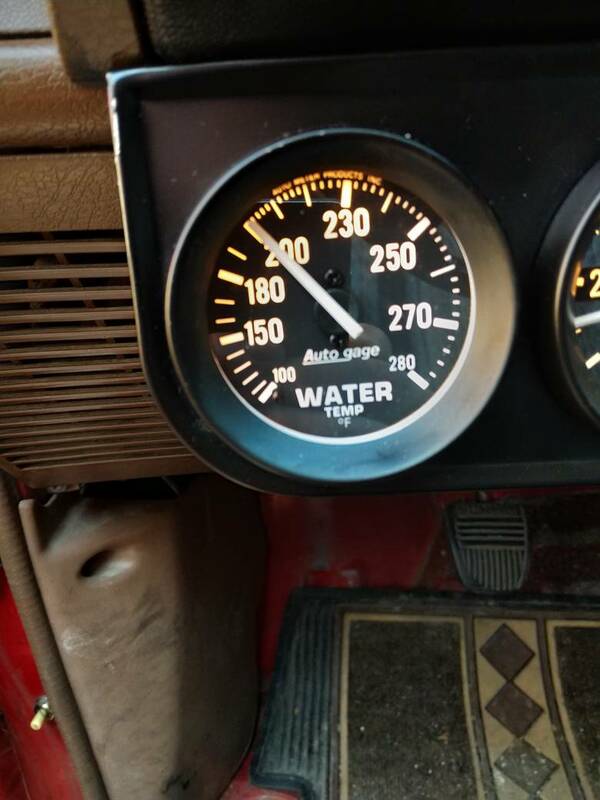 If I had a mechanical water temp gauge installed like my other trucks, I probably would not have toasted the engine when it ran low on coolant due to a sudden water pump failure. Since catastrophic failure of these engines due to over-heating is historical and is arguably the most discussed topic of any topic, it’s interesting why anyone, who owns a vehicle with one of these early Toy engines, would NOT spend the money and time to install a quality mechanical water temp gauge instead 100’s or 1000’s of dollars on bling. 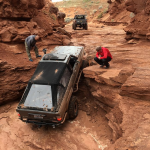 I don’t think you need to read Toybrota’s “experiment” to know about that facts on head, head gasket, and over heating failure issues with these engines…. Since the late 70’s?... about 30 or 40 years! By the way, installing gauges anywhere other than the driver’s direct line of sight is practically worthless. This is how I like it. I also prefer the same temp gauge just in a different color. Could you still fit an internal cage Chris? If yes, would the faces still be visible? I don't think so. Plan is for exo in the future. If I was going to do an internal cage I would locate the gauges here. Page created in 0.355 seconds with 33 queries.